I like the idea and taste of this dish, but the execution/method needs work. I envisioned a creamy stew with a lemony zing complemented by the unique flavour of dill. As far as taste goes, everything worked. 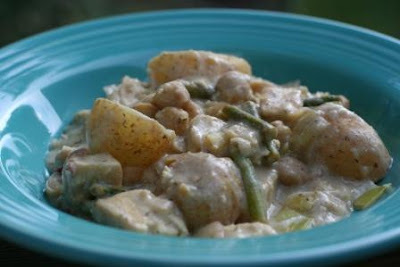 The potatoes and asparagus blended well with the spices, while the chickpeas provided an earthy undertone (and the tofu packing an extra protein punch). The problem lay with the cream sauce. I knew that lemon would make soy milk curdle, but I figured it would all come together when I thickened the sauce with flour. Not so much. The sauce remained "grainy" and so the dish did not look all that great. Rather than post a recipe, here is the basic idea of the dish. I started by parboiling baby yellow potatoes, and sauteing a sliced leek and some garlic in olive oil. I added cubed tofu and chickpeas, the potatoes cut into large chunks, and asparagus. I then added about 1/2 cup lemon juice and 2 tsp of dill, and then 2 cups of soy milk. After seasoning with salt and pepper, I blended flour in some water and added it to thicken the sauce. Does anyone know how to make a creamy sauce with lemon? I assume there is a way to mix the two since I have seen vegan lemon cheesecake and lemon curd. Maybe it needs to be blended first and then added?